The MY2019 KTM 450 RALLY REPLICA has a completely new chassis that has been re-designed to improve mass centralization, bringing the weight to the center and lower in the bike for more agility and stability over the previous model. A new swingarm, linkage and shock absorber with a new air filter box, fuel tanks and seat provide a range of improvements, especially in overall weight distribution. A shorter and lower Akrapovič exhaust continues with the mass centralization focus, which has been a key point of evolution in the new generation, while the bike is fitted with WP XACT PRO 48mm closed cartridge Cone Valve suspension, along with its high-quality Brembo brakes, a carbon navigational tower with new bodywork that encompasses sophisticated ergonomics and aerodynamics that make the bike more refined than ever. 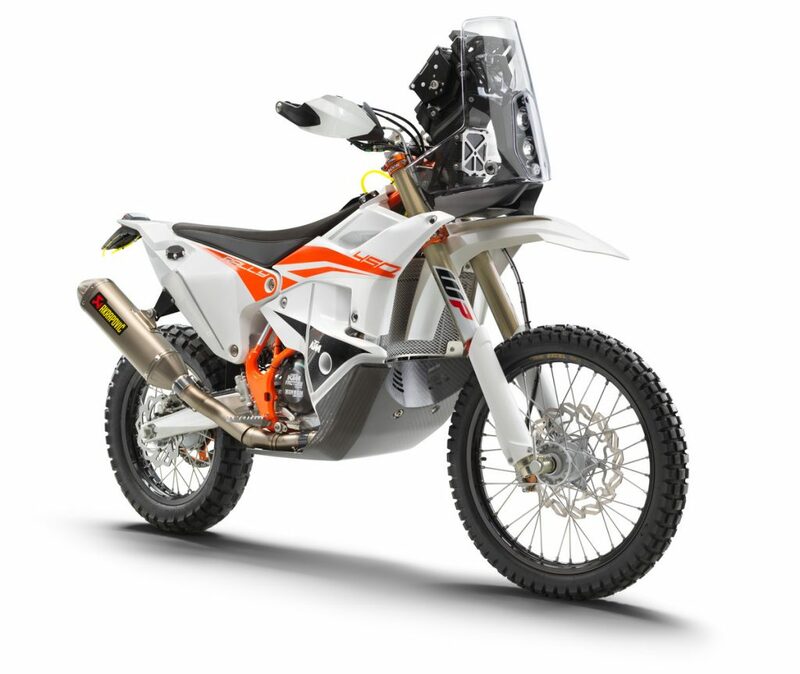 With a new 450cc fuel-injection engine with increased power thanks to a new cylinder head, and a new transmission that has been developed and tested in the severest of conditions, the MY2019 KTM 450 RALLY REPLICA is ready for anything when it comes to the perils of the Dakar. With only marginal differences to its factory counterpart, the KTM 450 RALLY REPLICA is made in limited numbers and developed by the Red Bull KTM Factory Racing Team. 75 units will be produced this year and all units have already been reserved before production – probably thanks to the high-quality components, innovation and the satisfaction of knowing during development the bike has been tested in anger by the likes of Dakar winners Toby Price, Sam Sunderland and Walkner. “The all-new KTM 450 RALLY REPLICA is based on our already-successful new factory machine that we began racing at the end of last year, which was specifically developed to win the Dakar. 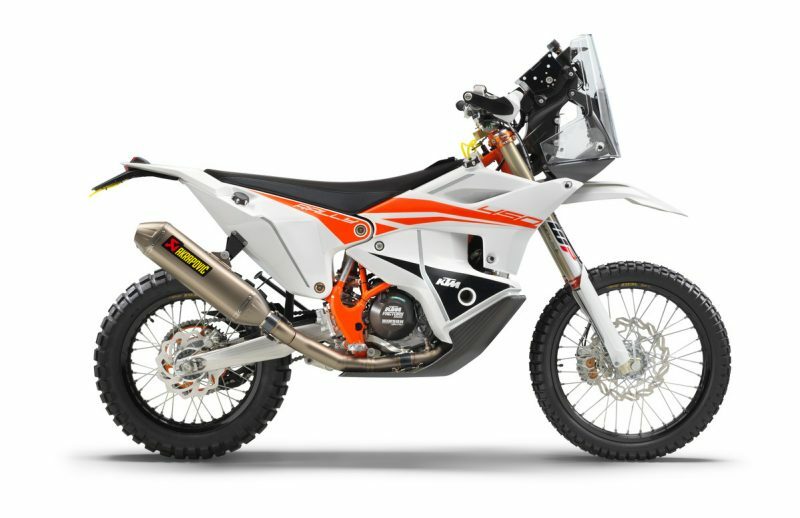 With the latest generation, our goal and focus was to develop a bike around the style of our current factory riders, who required something with more comfort, more agility and improved stability,” said KTM Factory Rally Team Leader, Stefan Huber (who is a guru of all things rally and rally development). Take a look at this thing of beauty. 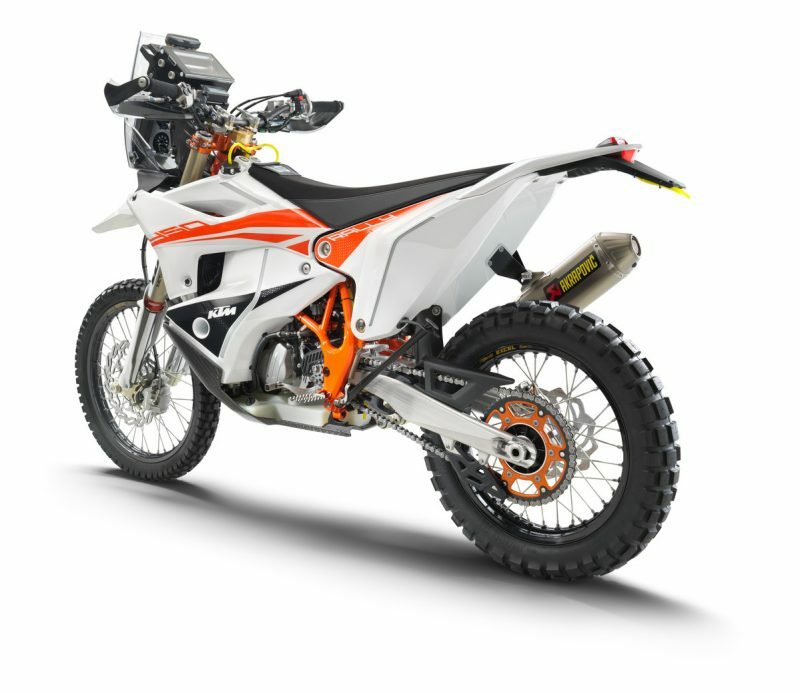 We might not all want to endure the extremes of Dakar with its freezing high-altitude mountainous stages, comprised with gnarly hard pack, desert and dunes in 50 degree temperatures over 1000’s of kilometers, but we’re pretty sure this would be a cool bike to own. 33 Responses to It´s new. It´s READY TO RACE. Introducing the KTM 450 RALLY REPLICA MY2019. Tried to order one, complete waste of time and effort. KTM’s network in the USA is a complete joke. Cannot be on a waiting list, cannot leave a deposit, cannot pay for it outright !!!! Then why the &^$&$ even put it out there……useless marketing…just makes me want to sell my other orange bikes….so frustrating. Please, stop messing around with so many prototypes and make motorcycles for sale for real people. I wouldn’t mind knowing a little more info about it (IF) I had the opportunity to purchase one. I use a 500 EXC as an adventure bike. I can see this working quite well. Might be a little over-kill. It’s only money. Totally counter productive, this bike is not even available for sale. Why bother with the big public announcement and limit production to 75 units! Just another factory bike not available to the general public! I can not buy new 640 Adventure. I can not buy new 990 Adventure. There is no 690 Adventure. You can win as many Dakars as you want, but this will not make me a customer for ugly and heavy 1090/1290 Adventure, or even uglier 790 Adv. WHAT DO YOU RIDE A WR250R? WHERE I WANT TO SEE IT? Useless. Where’s the 690 Adventure? Not available anywhere it would appear. Great, need price, where’s it made! Oh, and is it Street legal in California USA? $30,500 USD. Made in Austria. It is a rally bike, not a street bike. Certanly not available in Brazil! Snif. If its anything like the other models you could get its gonna cost in around 20-30 grand . Perfect for a light adventure bike!!!! Beautiful machine, lots of people are going to want to purchase it! That thing is ugly AF.